Lampang takes her sweet time spinning around people’s lives. It’s a charming town with perfect balance in people and culture. Visiting temples in Lampang is an ASEAN experience because there are both Thai and Myanmar temples for you to visit. You can take leisure walks seeing the way local people live their lives in old architectural buildings surrounding Kad Kong Ta (Night Market) or walking street along Mae Nam Wang (Wang River), the river of life for Lampang residents. Outside of town you can find other attractions such as Wat Chalermprakiat Prajomklao Rachanusorn, stunning stupa at the top of the hill in Chae Hom District, Thai Elephant Conservation Center, Phra That Lampang Luang and make sure you stop by various ceramic shops and outlets to take home with you Lampang’s finest quality ceramics. Experience the cool misty breeze all year round. Every day is as refreshing as the next. Fields of colorful flowers swaying in the wind wait to greet anxious tourists. Choose to admire Por Tueng Nong Pai, one of the vibrant fields of golden blooms, or the pink cherry blossoms along both sides of the road at Phu Tub Berg. Another attraction to visit is the agriculture farm at Khao Ko where you can enjoy activities, good food and take fresh produce home with you. ➜ Continue reading "12 cities, Thailand hidden gems"
The decade in which backpackers “discovered” Samui, which at the time was considered a coconut-harvesting backwater. Elevation, in metres, of the island’s highest point: the peak of the jungle-covered mountain known as Khao Pom. Samui’s land area, making it the kingdom’s second largest island after Phuket. The number of dolphin and whale species found in the Gulf of Siam, where Koh Samui is located. The number of islands that together make up Ang Thong Marine National Park, near Samui. ➜ Continue reading "Fun facts about Koh Samui"
Brunei, officially the State of Brunei Darussalam or the Nation of Brunei, the Abode of Peace (Malay: Negara Brunei Darussalam, Jawi: نݢارا بروني دارالسلام), is a sovereign state located on the north coast of the island of Borneo, in Southeast Asia. Apart from its coastline with the South China Sea, it is completely surrounded by the state of Sarawak, Malaysia, and in fact it is separated into two parts by Limbang, which is part of Sarawak. It is the only sovereign state completely on the island of Borneo, with the remainder of the island belonging to Malaysia and Indonesia. Brunei's population is around 400,000 (July 2010). 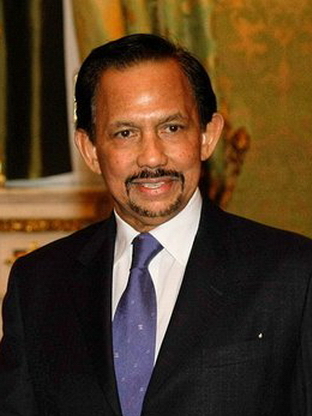 General Haji Sir Hassan al-Bolkiah Mu'izzaddin Waddaulah GCB GCMG (born 15 July 1946) is the Sultan and Yang Di-Pertuan of Brunei Darussalam, the 29th Sultan of Brunei (in a line that dates back to the fourteenth century) and the first Prime Minister of Brunei Darussalam. He is the eldest son of Omar Ali Saifuddien III, the 28th Sultan of Brunei, and Pengiran Anak Damit. Being the eldest son, he became Crown Prince in 1961 and ascended the Throne on 5th October 1967 following the voluntary abdication of his father, Al-Marhum Sultan Haji Omar Ali Saifuddien Sa'adul Khairi Waddien. He was crowned on 1st August 1968 in pomp and pageantry befitting Brunei's ancient customs and traditions. ➜ Continue reading "Brunei and the Sultan Haji Hassanal Bolkiah"
Ecuador is a very beautiful country which is rich in natural wonders, ranging from the hot springs of the national parks and the volcanoes to the beaches of the coast and the mangroves. There are countless things to do in Ecuador and the favorite attractions and activities in this country are the shops, nightclubs, museums, parks, coffee shops and many more. Here we will discuss about the main tourist attractions in Ecuador. The Galapagos Islands is best known for the wildlife which was studied by naturist Charles Darwin. The islands are a remote volcanic archipelago. The national park and marine reserve are formed by about 97 percent of the islands and surrounding waters and it attracts tourists from everywhere. The islands are only accessible by boat or plane and the help of an official guide is needed. Diving has become a very popular activity in the Galapagos and the area is frequently haunted by manta rays, iguanas, and whale sharks. The Quito Old town is located 9,350 feet above the sea level in Pichincha province and it was one of the first cities to gain UNESCO World Heritage listing. A majority of the mud-brick houses are built in the Spanish or Moorish style and are often covered by stucco or plaster. The religious and public buildings are very detailed featuring arched windows and statue-decorated exteriors. There are quite a few notable religious buildings here that include the Church and Jesuit College of La Compania and the monasteries of Santo Domingo and San Francisco, where you will find blended Spanish, Moorish Italian and indigenous style of architecture. ➜ Continue reading "The Top Attractions of Ecuador"
Norodom Sihamoni (Khmer: នរោត្តម សីហមុនី, born 14 May 1953) is the current reigning King of Cambodia. He is the eldest son of Norodom Sihanouk and Norodom Monineath Sihanouk. His name is derived from the first syllables of his parents' names. Previously Cambodia's ambassador to UNESCO, he was named by a nine-member throne council to become the next king after his father Norodom Sihanouk abdicated in 2004. Before ascending the throne, Sihamoni was best known for his work as a cultural ambassador in Europe and as a classical dance instructor. During the Khmer Rouge's four-year genocidal regime, which resulted in the deaths of more than a million people, King Sihamoni - along with most of his family - was kept under house arrest in the palace in Phnom Penh. Shortly after the Khmer Rouge fell to Vietnamese forces in 1979, King Sihamoni left Cambodia for France, where he pursued his love of classical dance at some of the leading conservatories in Paris. In 1992 he was given the position of Cambodia's ambassador to Unesco, a post he held until earlier this year, when he moved to Beijing to look after his ailing father. The first indication that King Sihamoni might succeed to the throne came at an Independence Day ceremony in 2002, when he deputised for the king. His presence came as a surprise to government officials and diplomats at the event, who saw it as a sign that Sihanouk was introducing his preferred candidate. King Sihamoni is so far seen as relatively pliant, which will suit Prime Minister Hun Sen, who has dominated Cambodian politics for the past two decades. Cambodia, with a population of 14.8 million and a GDP of USD 2,100.00, is one of the poorest countries in South-East Asia. ➜ Continue reading "Norodom Sihamoni, King of Cambodia"
Akihito (born 23 December 1933) is the current Emperor of Japan, the 125th emperor of his line according to Japan's traditional order of succession. He acceded to the throne in 1989, after the death of his father, Emperor Hirohito, on 7 January 1989. In Japan, the emperor is never referred to by his given name, but rather is referred to as "His Imperial Majesty the Emperor" which may be shortened to "His Imperial Majesty". The Emperor of Japan is, according to the 1947 Constitution of Japan adopted by the Postwar Japanese government, "the symbol of the state and of the unity of the people," which simultaneously dissolved the Empire of Japan. He is a ceremonial figurehead under a form of constitutional monarchy and is head of the Japanese Imperial Family with functions as head of state. He is also the highest authority of the Shinto religion. In his dual role as head of a religion and head of state the Emperor resembles the British monarch, who is "supreme governor" of the Church of England. Unlike most constitutional monarchies, the Emperor is not even the nominal chief executive explicitly in the Constitution of Japan, but has duties "in matters of state", which are closely regulated. The constitution states that the Emperor "shall perform only such acts in matters of state as are provided for in the Constitution and he shall not have powers related to government" (article 4) and that the "advice and approval of the Cabinet shall be required for all acts of the Emperor in matters of state" (article 3). Article 4 also states that these duties can be delegated by the Emperor as provided for by law. Article 65 explicitly vests the executive power in the Cabinet, of which the Prime Minister is the leader. ➜ Continue reading "Japan, Akihito, Emperors and Shoguns"
The Yang di-Pertuan Agong is the head of state of Malaysia. The office was established in 1957 when the Federation of Malaya (now Malaysia) gained independence. A literal English translation of the title is "He who is made Lord". However, common alternatives are "King", "Supreme Ruler", "Paramount Ruler", or "Supreme Head of State". Malaysia is a constitutional monarchy with an elected monarch as head of state. The Yang di-Pertuan Agong is elected to a five-year term by and from among the nine hereditary rulers of the Malay states. The Yang di-Pertuan Agong is one of the few elected monarchs in the world. In Malaysia's constitutional monarchy, the role of the Yang di-Pertuan Agong is largely ceremonial. The constitution specifies that the executive power of the Federal government is vested in the Yang di-Pertuan Agong and is exercised by him on the advice of the federal Council of Ministers. The latter is headed by the Prime Minister, appointed by the Yang di-Pertuan Agong from among the elected members of Parliament. The current Yang di-Pertuan Agong is Sultan Abdul Halim of Kedah. ➜ Continue reading "Malaysia, Yang di-Pertuan Agong and Sultan Abdul Halim of Kedah"
The Monarchy of Thailand (also referred to as the King of Thailand or historically as King of Siam) refers to the constitutional monarchy and monarch of the Kingdom of Thailand (formerly Siam). The King of Thailand is the head of state and head of the ruling Royal House of Chakri. The king's power is limited to being a symbolic figurehead, but the institution commands the respect and reverence of the Thai people. Bhumibol Adulyadej is the current King of Thailand. He is known as Rama IX (and within the Thai royal family and to close associates simply as Lek). Having reigned since 9 June 1946, he is the world's longest-serving current head of state and the longest-reigning monarch in Thai history. Since the end of the absolute monarchy in 1932, each constitution has maintained the king as "enthroned in a position of revered worship and shall not be violated." His Majesty, however, in his 2005 national birthday broadcast, specifically indicated he was unhappy with the provision. Despite this royal wish, Thai state authorities have steadfastly refused to permit not just criticism but what they deem to be inappropriate discussion. The constitution exempts the king and the royal family from legal actions, but confers no other legal rights. Therefore, the monarchy is protected against any physical or defamatory threats. This provision against defaming the monarchy is known in the West as the lèse majesté law. ➜ Continue reading "Thailand and King Bhumibol Adulyadej, the world's longest-reigning monarch"
On the companion Blog to Landolia, choose your next destination, and prepare your trip. Do you have an interesting travel article? If so Contact us and share it.